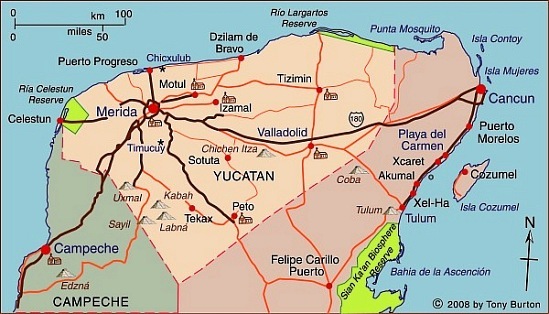 Yucatán state (see the map below) has an area of 39,612 square kilometers and a population of 1,945,840 (2010 estimate). Its distinctive landscapes include coastal rias (drowned river valleys, such as Celestún) and tropical karst (limestone scenery). The state’s capital city is Mérida, the “white city” (2009 population: 955,000). Map of Yucatán state. Copyright 2010 Tony Burton. All rights reserved. The state was an important sisal-producing area during the 19th century. Sisal was exported all over the world through the port of Sisal [see comments], later surpassed as a port by Progreso. The state has numerous important Mayan sites, including Uxmal and Chichen Itza. These sites have led to cultural tourism becoming very important to the state’s economy. Several cities, including Mérida and Izamal, have outstanding examples of colonial architecture. Several former sisal haciendas have been turned into luxurious hotels. Several attempts have been made in recent decades to link the Yucatán Peninsula to the US Gulf coast by vehicle ferry, but none has yet succeeded. Such a route would save several days of driving time and would be a huge boost to overland tourism in the state, since many of its potential cultural and eco-tourist attractions are not very easy to reach by public transport. During the 19th century the main port of the Yucatan was the town of Sisal. Henequen fiber was primarily exported through the port of Sisal. Bails of the fiber were stamped with the name of the port “Sisal”. That is how the fiber got it’s name in the English speaking world. Later the port of Progreso does surpass Sisal.